Union Iron Works, headed by Irving M. Scott, had become a major war contractor leading up to the Spanish American War and the occupation of Hawaii in the 1890s. Dogpatch was filled in with rock by the railroad companies and Pier 70 became Union Iron Works’ center of operations. Editor’s Note: This is Part One in a three-part entry on San Francisco’s Dogpatch and Pier 70. The series follows the organized labor history of the Gilded Age’s most influential industrialist: Charles M. Schwab and his Bethlehem Steel. It was once a small promontory on the southeastern edge of San Francisco — an outcropping of California’s state rock that would eventually be razed for a working-class ‘company town’ known as Irish Hill. A short walk to the north was Dogpatch, a marshy no-man’s land until a few powder works moved in to provide gold mines with much-needed explosives. The railroads followed, and soon a bridge was built to cross the swamp. Dogpatch was the center of San Francisco’s Imperial Age industrial might. Out of a swamp arose Union Iron Works. It had grown from a small forge producing stamp mills for gold mines to the largest ship builder on the West Coast. Throughout its history, the story of labor is inextricably bound to the site of Union Iron Works. According to Christopher VerPlanck, “no other district of California was industrialized to the degree of Portrero Point during the last quarter of the 19th century.” In this rough area of industrial San Francisco we see the perfect example of war’s inextricable connection to organized labor. Seen from the surface, labor may benefit from a wartime economy, but in general it stymies organized labor and ensures the governmental regulation of labor organizations. A prime example of this is told through the legacy of Charles Schwab and his San Francisco shipyard. Irving Scott’s Union Iron Works started as a Gold Rush company but really grew big on the business of American Imperialism. In the 1880s to 1890s the U.S. Navy experienced incredible growth in its fleet — so much so that it became known as the “New Navy.” The impetus for growth was primarily due to the U.S. interests in the Pacific (particularly Hawaii) and the looming overthrow of Hawaii’s Queen Liliuokalani, which would provide a perfect port for U.S. naval occupation. 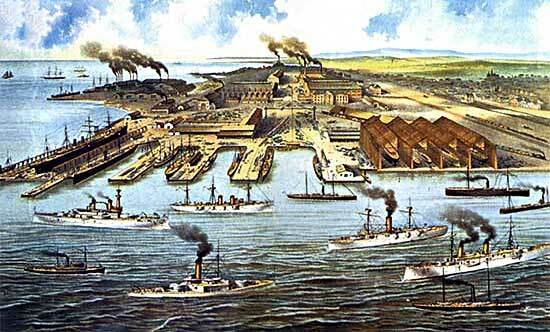 By this time, Union Iron Works was no stranger to shipbuilding and Irving M. Scott knew that the Navy would need frigates on the West Coast. 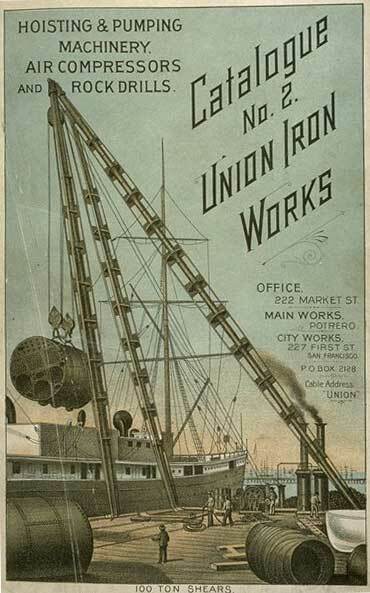 Scott secured the first Navy contracts for Union Iron Works, which would help it become “the largest shipyard in California and the dominant manufacturing facility on the West Coast” (VerPlanck). This entry was posted on Thursday, April 12th, 2007 at 2:01 pm	and is filed under Built Environment, Industrial, Military, Special Series. You can follow any responses to this entry through the RSS 2.0 feed. You can skip to the end and leave a response. Pinging is currently not allowed. I’m trying to find anything on the Union Iron Works gold dredges, can someone please help. Saw mention of Union Iron Works 1896 employee records on website. Trying to locate any info on my paternal grandfather,James Earnest Molyneaux, shipwright from PA, who committed suicide after losing a hand in an industrial accident after 1891. Could you please check to see if his card appears. Any info would be appreciated.